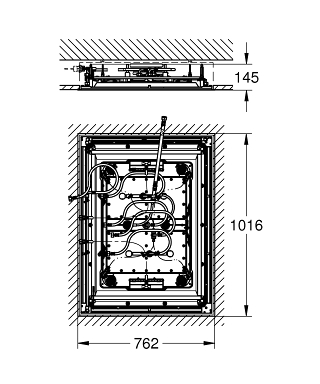 The ceiling construction must be appropriate for the static requirement of the product (total product weight > 70 kg). Ceiling shower has to be controlled by 8 outlets + 1 hand shower outlet and the performance of the waste must be of sufficient size (> 100 l/min). For detailed planning please see separate planning & installation guide before start.